Still busy drooling over Shahid Kapoor's brilliant portrayal of Kabir Singh? Well, you got another fan in Vijay Deverakonda. The actor who essayed the role of Arjun Reddy in the original movie is singing praises for the remake and the actor of course. While Twitterati is blown away with Sasha's act and find him convincing enough to step into Vijay's shoes, the biggest approval is coming from the man himself. Deverakonda took to his Twitter account to congratulate the team of Kabir Singh with his kind words and his nod of approval further makes us eager beaver to catch the final act on the big screens. 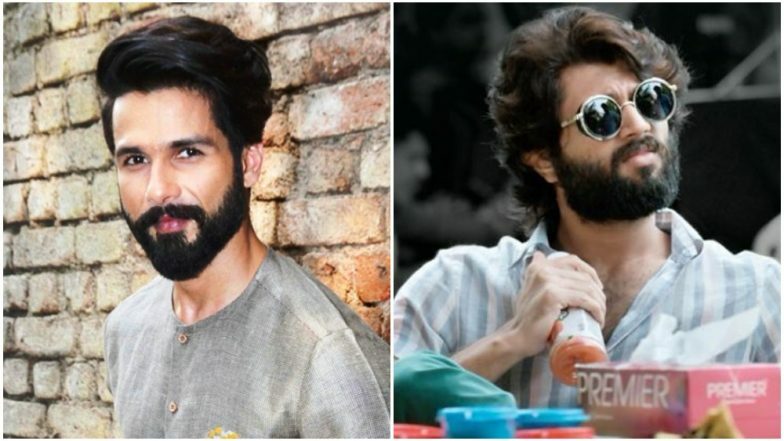 Kabir Singh Teaser: Shahid Kapoor's Drunk and Don't-Give-A-Damn Attitude Gave Us the Perfect Arjun Reddy Hangover (Watch Video). The makers of Shahid's Kabir Singh released the film's teaser video which gave us a glimpse about this remake and how similar is it to the original idea. Shahid did a fine job in playing an alcoholic doctor who's trying to come on terms with his breakup. Though we wished to see some more of Kiara Advani, we believe the makers have lots in store for us in the film's trailer that will be released very soon. Salman Khan’s Notebook, Shahid Kapoor’s Kabir Singh to Not Release in Pakistan After Pulwama Terror Attack. Kabir Singh is an official remake of Arjun Reddy and there were reports about Arjun Kapoor being a part of it initially. However, with Shahid's entry, we believe he was always a better choice to play the lead and it's time we start rooting for his chemistry with Kiara Advani.